Science Fair Projects - The invincible soap bubble! Do you like playing with bubbles? Almost every kid loves to blow bubbles – and wishes that their bubbles don’t pop or evaporate so quickly! This science fair project was performed to determine if adding other substances to a bubble solution can help the bubbles last longer. Testing was done by adding corn syrup, sugar water, glycerin and lemon juice the to the bubble solution. Soap bubbles made from solutions containing glycerin will last the longest. Blowing soap bubbles has always been enjoyable to children. . Bubbles however, usually do not last long and burst easily when they come into contact with another object. Sometimes, they simply dry up. Bubbles are formed because of the surface tension of a liquid. A bubble made with a pure liquid such as water is not stable. Adding soap to water helps to stabilize the bubble. Bubbles are very light because they are made up of air and a thin layer of fluid that forms a sphere around the pocket of air. They float easily. A slight breeze will be enough to lift the bubble up into the air and cause it to float until it bursts when it collides into another object or when the layer of water on the exterior of the bubble has evaporated. 1. For this science fair project, the independent variable is the additive added to the bubble solution – soap, corn syrup, glycerin, sugar and lemon. The dependent variable is the length of time the soap bubbles are able to last before bursting. This is measured with a stopwatch. The constants (control variables) are the room temperature and the mixing ratio of the bubble solution. 2. Using the black marker pen, the 5 plastic cups are labeled as “soap”, “corn syrup”, “glycerin”, “sugar” and “lemon”. 3. Each cup is filled with 100ml of water. Another 20ml of liquid detergent is added to each cup and mixed with the water. Then, depending on the marking on the cups, 10 ml of corn syrup, glycerin, sugar and lemon is added to each cup and mixed once more. The cup marked soap will be the control and it contains only a mixture of water and detergent. 4. The bubble blowing toy is dipped into one of the plastic cups and a bubble will be blown. The stopwatch is started and it is observed how long the bubble lasts before it bursts. The experiment is repeated 5 times and the longest time clocked, is recorded in the table given below. 5. Procedure 4 is repeated using the solutions in the other 4 cups. The longest time taken before the bubble bursts is clocked and the results recorded in the table below. The results show that the combined solution of water, liquid detergent and glycerin produced bubbles that lasted the longest. The hypothesis that soap bubble solutions containing glycerin will last the longest is proven to be correct. Bubble solutions are normally made of a combination of water, detergent and glycerin. Glycerin is a thick, clear and odorless substance that is a byproduct of the soap-making process. Adding glycerin to the bubble solution will help to increase the lifespan of the bubble. When dissolved in the bubble solution, glycerin forms a weak bond with hydrogen, that helps to delay the evaporation of the water layer in the bubbles. 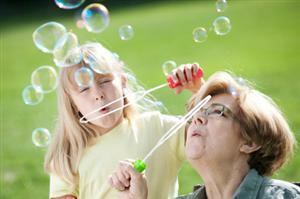 Blowing and playing with soap bubbles is very entertaining for children and adults. It is a very inexpensive and good way to spend quality time with children. The market for soap bubble toys is also growing. New battery operated bubble producing devices are constantly being developed. These devices are able to produce larger bubbles, at a much faster rate. Bubble solutions that produce longer-lasting bubbles are also being invented. Imagine a bubble that does not burst upon impact with solid objects! That would be lots of fun! Repeat the above science fair project using other additives like vinegar or salt. Try to compare the results by repeating the experiment at different room temperatures. Would the humidity of the air affect the size of the bubbles, and how long they last?